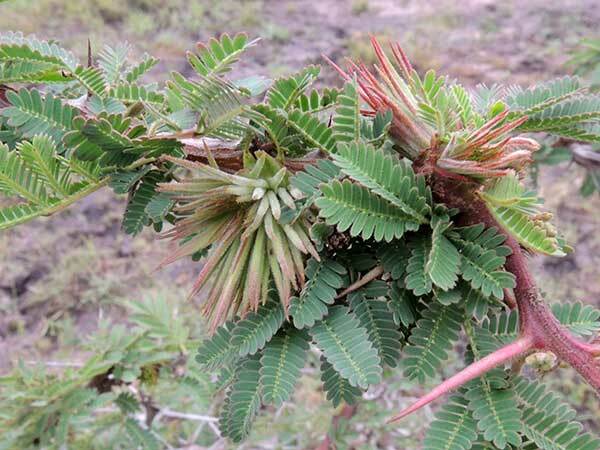 Shoot gall on Acacia seyal near Machakos, Kenya, May 2017. It could be that my guess is wrong and that the arthropod at the center of this deformed shoot is not a minute fly called a Cecidomyiidae. There are thousands of Gall Gnat species each producing a different type of gall on different plant species. The larvae (maggots) are very small, white or orange in color. Their feeding activity together with hormone analogs cause the gall to form and thus giving them food and shelter. Cutting open the galls might reveal these small larvae. The adults emerge as frail flying insects that are rarely noticed due to their small size. Copyright Michael J. Plagens. Page created 6 Oct. 2017.